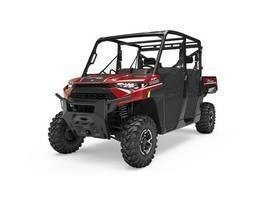 The all-new RANGER CREW® XP 1000 brings added passenger and payload capacity to the worlds Hardest Working, Smoothest Riding® utility side-by-side. Its more rugged, more refined, and fueled by over one-hundred owner-inspired improvements. Get more done with the industrys most capable six-person utility side-by-side. Beneath its muscular yet refined exterior, youll find the strength of a class-best 82 horsepower ProStar® engine. Tow up to an industry-leading 2,500 lbs, or conquer tough terrain with up to 13'' of ground clearance and 11'' of suspension travel. Industrys largest stock bumper, designed to bear the brunt of any punishment, protect the new body work and loaded with accessory integration points. All-day comfort with new, 25% thicker, more durable, cut-and-sew contoured seats. Its now easier than ever to jump in and out of the machine with an additional 5 of clearance in the front and rear.